We are still in Oscar mode for our weekly Movies & Munchies and while I planned to post today about The Descendants, I forgot that Mr. Movie Fuel hasn’t seen that movie yet! He chose a film that is nominated for special effects, Real Steel. I LOVED this movie. Totally a great rental and family friendly (for 8 years old and up I would guess). 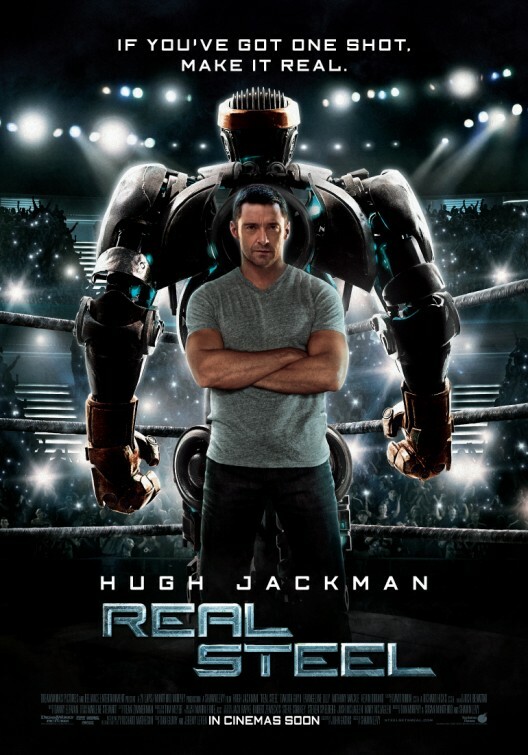 Starring: Hugh Jackman, Evangeline Lily and a Bunch of Robots! The older I get, the more I realize that I would rather see a less than perfect, fun and entertaining film than an artfully crafted Drama. Sometimes you go into a movie with low expectations and are pleasantly surprised with what you get. After enduring three Transformer movies, it is nice to see a move about fighting robots with some life in the story and in the characters. Even though the film takes from so many other cinematic stories before it, Real Steel does enough to feel fresh and new. As a father, I am a sucker for a father and son film. Taking place in the near future, a father and son find an old robot they polish off and use to fight other robots for money. As likeable as Hugh Jackman is in most of his films, he does a good job of convincing us here that he is a deadbeat dad and a has-been boxer searching for something that’s not there. We want to see him find redemption, but believe there is certainly a possibility that he won’t and would be ok with that because he is so despicable. These are not Michael Bay’s incoherent, chaotic robo-fighters. With well orchestrated boxing matches, thanks to the choreography of boxing legend Sugar Ray Leonard, combined with the stellar Academy Award nominated special effects, the audience is treated with ring action as intense and exciting as any human match. I love what filmmakers are doing with special effects these days. Until the 2000′s, filmmakers would often use what is called animatronics to create special effects; essentially building robotic animals, creatures, non-human subjects and filming them with live actors. Then in the past ten years or so, all of that has been replaced with computer generated characters which can sometime seem less realistic. Now, filmmakers are recognizing that the surreal effect is not as convincing and have now started combining animatronics with computer generated effects and the results are incredible. In this film in particular, you have the realism of the actual built robot on the set with the unlimited capabilities of computer effects layered over the character and the entire scene. Director Shawn Levy (Night at the Museum) does a great job with providing something for everyone and balances the corny storyline with some genuine heartfelt moments and tons of action to maintain the audience’s attention. Whenever I mention this film to anyone, they automatically write it off as something they would never see and are surprised when I enthusiastically recommend it. But, if you can leave your preconceptions at the door, you may find that Real Steel is well worth the ride admission. Fathers, sons, gamers, everyone will love this fun and compelling underdog tale. It was tempting to try and create “healthy” recipes for arena foods (corndogs, pink popcorn), but I decided to take a different route today. The little boy in this movie hates hamburgers and it is running joke, of sorts. I thought I would combine a turkey burger and popcorn by making some crunchy, feisty turkey fireballs! These were inspired by a totally delicious turkey burger my friend Jody created using quinoa, the super-grain! I also made these because I have The Hunger Games on the brain. I just finished Chasing Fire and am ready to read Mockingjay on my Valentine’s Day gift, a Kindle Fire! I know this sounds dramatic, but the Kindle Fire is life changing. I love it! Preheat oven to 375 degrees. Use a large pan that is also oven safe. Combine all ingredients. Roll small balls and brown at least one side in an oiled pan over medium-high heat. Place pan in oven and bake for 15 minutes or until cooked through. I ate these fireballs on a salad of romaine, broccoli, lemon juice, salt & pepper and cottage cheese. I have always been totally annoyed at celebrity interviews where the star claims they eat their salads with lemon juice and salt & pepper instead of dressing, but there is something to it! I’ve noticed as long as I have a creamy protein (yogurt or cottage cheese), I can mix everything up and it is better tasting than most bottled dressings. Give it a go!